In the summer of 2000 I was ecstatic to lead my very first youth group at a church in Virginia Beach, Virginia. With two years of Bible college and a 1-year internship under my belt, I thought I was ready to take this group by storm and radically change every life for Christ. I was pumped! Although it started well despite my unrealistic expectations, I quickly learned a very important lesson about ministry leadership: almost everyone has a different idea of what ministry looks like and how it should be done and somehow I needed to work with them all. Everyone in the church agreed with my game plan at the very beginning, but only a few short weeks later I was so frustrated, hurt and angry that I wanted to quit and go home. The pastor asked me to do all the “dirty work” he didn’t want to do, parents complained to the deacons that the group wasn’t growing larger yet, the kids wanted me to go play basketball, the elderly banned us from half the church building because we broke too much stuff, and no one thought I was putting in enough work hours. There was so much tension and opposing expectations from so many different people that I felt I might collapse under all the pressure. 1. The tension of results. (What?) This tension comes from various sources. Some of it comes from the people in our ministry who want to know what we’re doing and what it’s going to produce. Other times it is self-inflicted, thinking, “I need to produce results so people think I’m worth something in this position.” Unfortunately, attendance growth become the default results we look for, but it could also be a myriad of other things, such as a perceived level of acceptance and approval from church members and other community youth workers. We need to lead with people who push for results, results, and more results. 2. The tension of relationships. (Who?) There’s also time that needs to be invested into people. Of course there’s students, but there’s also parents, our Sr. Pastor, church members, other co-workers, community organizations, businesses that offer donations, school teachers, athletic coaches, not to mention our own families. Spending adequate time building all these relationships could be a full-time job all by itself! 3. The tension of the process. (How?) Results are one thing, but getting those results is a tension of formulating a plan and getting others on board. Building relationships also takes a plan. Nothing just happens by itself. If the ministry is going exist at all, it will require that there’s a process for reaching goals, even if the goals aren’t explicitly stated. As leaders it’s critical that we have a healthy self-image because others will often be more than happy to challenge it. If it’s dependent on what other people think and say, navigating the church system will be impossible. We’ll always be running around with our tail between our legs, trying to please everyone, saying YES to everything, and burning out faster than a cardboard match. That’s not being a leader — that’s following everyone else. When our own self-identity is secure, all the other relationships surround it. Students. Most of the time when youth workers are released from their jobs it’s because we’re struggling in an area outside of the kids. We aren’t usually fired because we’re bad with students. Actually, this is usually where we excel because the reason we go into youth ministry in the first place is because we love kids so much. Most of our problems in ministry lie elsewhere. Parents. We have a unique relationship with parents because they pay our salary, they have a clear perception of what they want from the youth ministry and we try our best to partner with them. When one of those latter two aspects gets a little out of sync, it can be a big mess. Sr. Pastor. The greatest variable to a youth pastor’s long-term success is the relationship with the Sr. Pastor. They will either be our biggest ally or our worst enemy. Respect their wisdom and communicate often. Other staff. Hopefully our co-workers see us as professionals because we treat them with respect and handle ourselves with maturity. Sometimes we have to wear a different hat with each person, but that goes along with the ministry territory anyway. Other adults. There are committee members, parents, leadership team, board members, volunteers, senior citizens, etc. We speak at women’s meetings, board meetings, and annual meetings not because it’s just another “speed bump,” but because that’s where we earn respect and establish credibility in their eyes. Peers. Hopefully we all have personal friends whether they’re ministry related or not. If we don’t have those personal friendships, then we need to make some friends outside the church ASAP! Family. Perhaps of highest priority is the wife and then the children. Community. The impression you leave in the community is the impression they will develop about your church and its ministry. Christ. 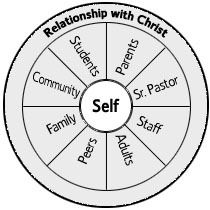 All of these relationships are encompassed by the most vital relationship of all — our personal relationship with Christ. Navigating the church system requires that we keep the tensions in check and our relationships healthy. 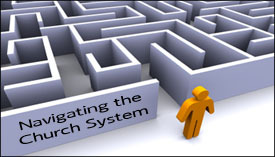 Navigating the church system (1 of 5): Youth workers need help!